Typically people only have three forms of truly renewable energy available to them: wind, solar, and geothermal. On this page we will deal with the second most potent form available: wind. So it is important to realize from the beginning that your power output will be irregular at best. For those of you that aren’t as geeky as I am, there is something subtle here. When you double the wind speed, the power output increases 8X! 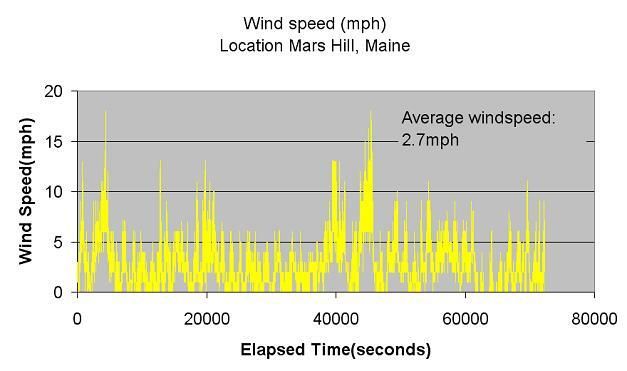 When you think about that and the chart above, you realize that when a windmill makes power it comes in constantly changing surges and you are likely to need overload protection. 267.4 kWhrs per year. OK..That’s not tiny but my farm house with an electric stove, dryer, in law apartment, and hot water heater uses 1200 kWhr’s per MONTH. That six foot windmill isn’t going to get me off grid any day soon. If you play with the calculator the numbers say I need a windmill 45 FEET in diameter to be off grid with wind alone.